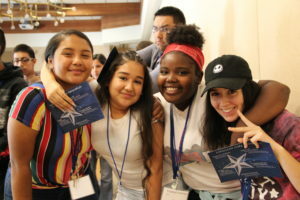 OAKLAND – The inaugural freshman class at Cristo Rey De La Salle began their summer preparations with an overnight visit to St. Mary’s College. Lifelong bonds were formed among our first cohort of students as they gained exposure to college life on the bucolic Moraga campus. Our student associates learned the ins and outs of college applications and financial aid, met with our Corporate Partners, and were treated to an ice cream social by the De La Salle Christian Brothers! We returned to the St. Elizabeth campus on Wednesday, July 11 for classroom training from our Academic and Corporate Work Study Program staff. Students and faculty alike are treated to daily guest lectures from local entrepreneurs and professionals. And we’ve also been drumming up school spirit with a host of new cheers and chants. Our team of young student associates is looking forward to pairing up with our Corporate Partners on Draft Day August 3…the ambition and talent on display is positively astounding. Go Mustangs!